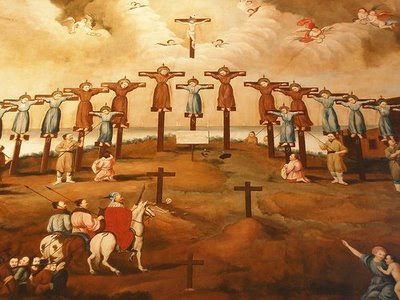 St. Paul Miki, a Japanese Jesuit along with 2 other Jesuit priests, six Franciscans, (4 of whom were Spanish), one Mexican, one Indian, and 17 Japanese, including lay people, were martyred near Nagasaki after a journey to impress the population that they were trying to prepare the way for the Spanish and Portuguese to conquer Japan. Just like Jesus, they were all pierced with a lance. This happened 45 years after St. Francis Xavier had evangelized much of Japan. They were canonized in 1862. What was the opening greeting of the angel Gabriel to Mary when he announced the birth of Jesus?